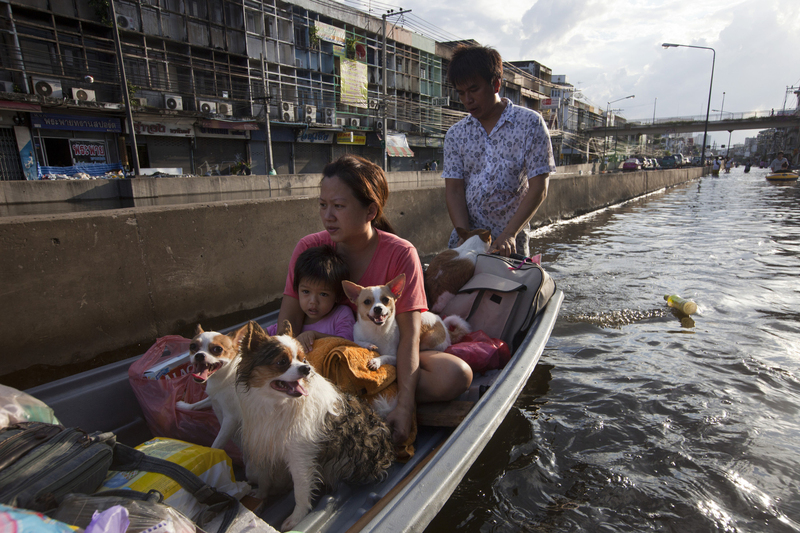 BANGKOK,THAILAND - OCTOBER 29: A Thai family evacuates with all their dogs in a boat through a flooded neighborhood near the Chayo Praya river as rising waters threaten parts of the capitol city October 29, 2011 in Bangkok, Thailand. Hundreds of factories have been closed in the central Thai province of Ayutthaya and Nonthaburi. Thailand is experiencing the worst flooding in over 50 years which has affected more than nine million people. Over 400 people have died in flood-related incidents since late July according to the Department of Disaster Prevention and Mitigation.